Bellevue-area resident Mary Ann Knight has seen a lot of changes in the Wood River Valley since she moved here at the age of 2 in 1944. In her first year of eligibility, Knight was selected by the Papoose Club to represent Bellevue in the 2012 Blaine County Heritage Court. Mary Ann Knight looks wistfully at the past, when Bellevue wasn't much more than a wide spot in the road and she knew everyone in Hailey. After living in the Wood River Valley for 68 years, Knight has seen plenty of changes. "I could make it to Hailey in 12 minutes tops. Now it takes me 12 minutes to get on the road," she said Tuesday in an interview at her home near Glendale Road. "But I don't have to drive anymore—thank God I'm retired." Regardless of retirement, Knight still stays busy, enjoying water skiing, but proclaiming that it's "nothing fancy." She's still an avid horseman and involved with numerous community organizations, including the Sawtooth Rangers and the Sawtooth Chapter of the Back Country Horsemen, acknowledging that she organized the local chapter of the international organization in 1985. She's also active with 4-H, organizes functions for the annual Days of the Old West Rodeo and, along with Bill Sherbine, has driven the Blaine County Heritage Court carriage in the Hailey Fourth of July parade since the Heritage Court was started in 2003. "This time I get to ride in the back," said Knight, regarding her selection this year to be a member of the court. At 70, Knight was selected in her first year of eligibility to represent Bellevue on the Heritage Court. She was selected for the court by the Papoose Club, and is thrilled with the appointment. "Oh my gosh, what an honor, unbelievable," Knight said. "You just don't think about anybody adding up all those things over the years. It's just great, it's humbling." Knight has lived in the valley for 68 years, coming here with her family at the age of 2 in 1944. They were farm folk, but Knight said she didn't want to spend her life doing farm work. "I was very anxious to get off the farm," she said. "I was tired of irrigating and picking potatoes and whatever, so I got a job in Sun Valley." 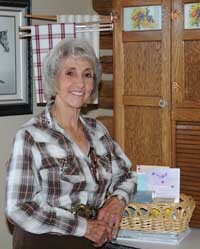 She graduated from Wood River High School in 1960 and later married Don Knight, who was fresh out of the military. "I loved him until the day he died in 1982," Knight said, remembering fondly the community support she received after her husband's death. "My emotions are stuck in the past because the valley just came to the rescue when Don passed away," she said. "I had three kids to support. They helped me so much and put together a benefit and I'm just really grateful." Before that, Knight became involved in dentistry, a profession she worked at for 44 years, first as a receptionist and later, after attending classes and becoming certified, as a dental assistant. "I actually started out working for Dr. Richards, who was the only dentist in the county at the time," she said. There are lots of dentists now in Blaine County, and a lot more people than when Knight was young. She admits that she was more content with the older lifestyle. "I would like it to be quieter," she said. "Life seems to have gotten in a rush and it just didn't used to be that way. I used to know everyone in town and now I just don't know everybody." Regardless of the changes, Knight said she plans to stay in the Wood River Valley, though a daughter has urged her to move to the Kuna area. "I guess I'm just not gutsy enough to move," she said. "I'm guess I'm staying here on this 40 acres." Ann Christensen, Marsha Riemann, Mary Ann Knight and Mary Peterson will be honored by the Blaine County Historical Museum at a public celebration and reception at the Liberty Theatre in Hailey at 3 p.m. Sunday, June 24. The women, who make up the ninth Heritage Court to date, will also ride in a horse-drawn carriage in the county's summer parades.